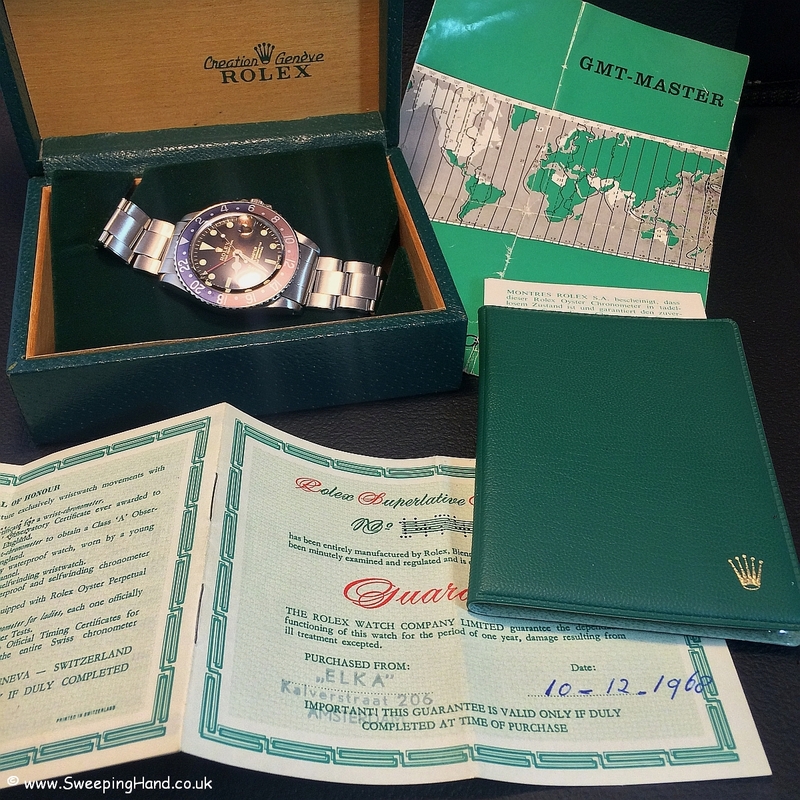 Here we have a stunning 1966 Rolex GMT Master with amazing tropical brown glossy gilt dial, original coffin style slash card box, super rare 60’s Rolex GMT Master booklet and original Rolex PUNCHED guarantee papers making this the perfect rare collector set! 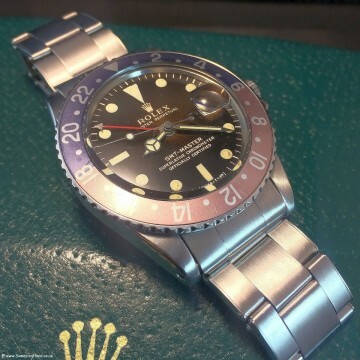 The 1.4m case dates the watch to late 1966 but it was first sold in Amsterdam by an authorised dealer in 1968 and the punched guarantee is stamped by the dealer to confirm this. 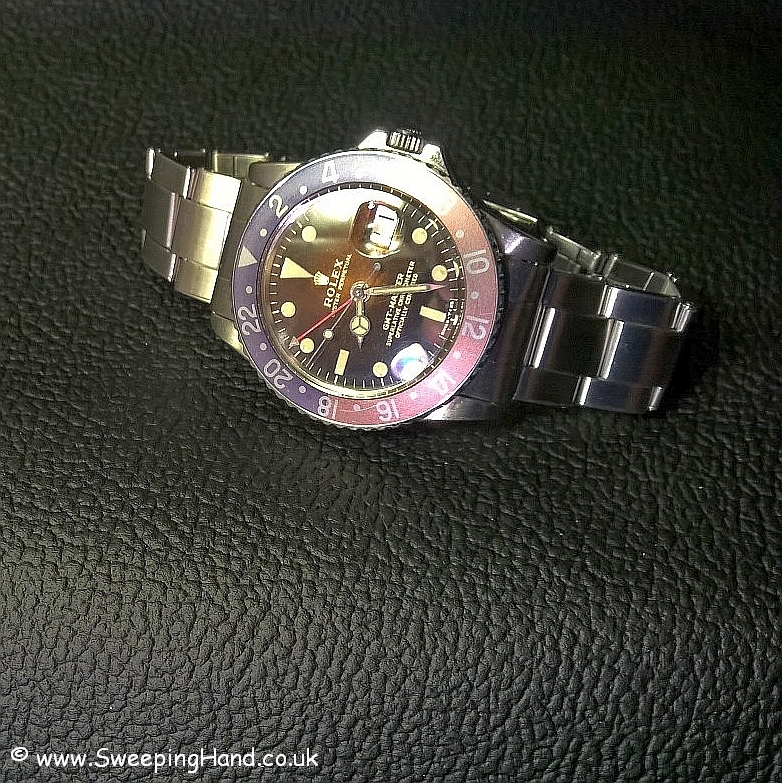 The dial on this watch is fantastic – in mint condition it has no marks or chips and the lacquer is perfect. The glossy gilt dial has turned a beautiful dark chocolate colour that turns lighter shades of brown in different lights. It really has to be seen to be appreciated and extremely rare and sought after for a gilt dial Gmt Master. 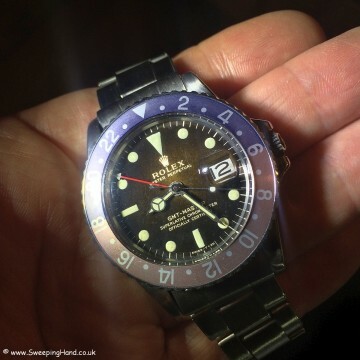 The lume is the original puffy/lumpy tritium typical of late gilt dials and has excellent original lume matching hands and of course comes with the small GMT hand and original date wheel. 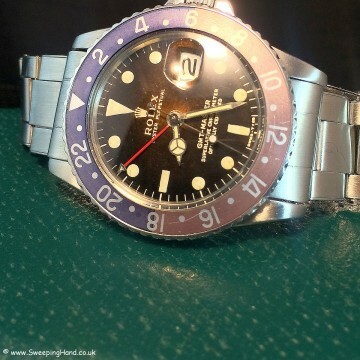 The bezel insert is a later one however it has faded to an amazing denim and pink shade and works with the watch perfectly. 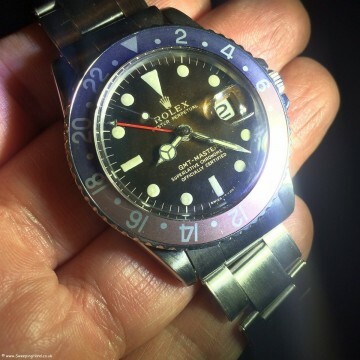 The case is in really nice condition free from noticeable dings or scratches; obviously it has had a light polish in it’s lifetime at some point, like most watches of this age, but the lugs are a good size and strong as are the crown guards. All model numbers and serial numbers are clearly readable and match the guarantee certificate. The watch comes on it’s great original 7206 folded link bracelet date stamped 1.67 with correct 80 end pieces and only very slight stretch so perfectly wearable. 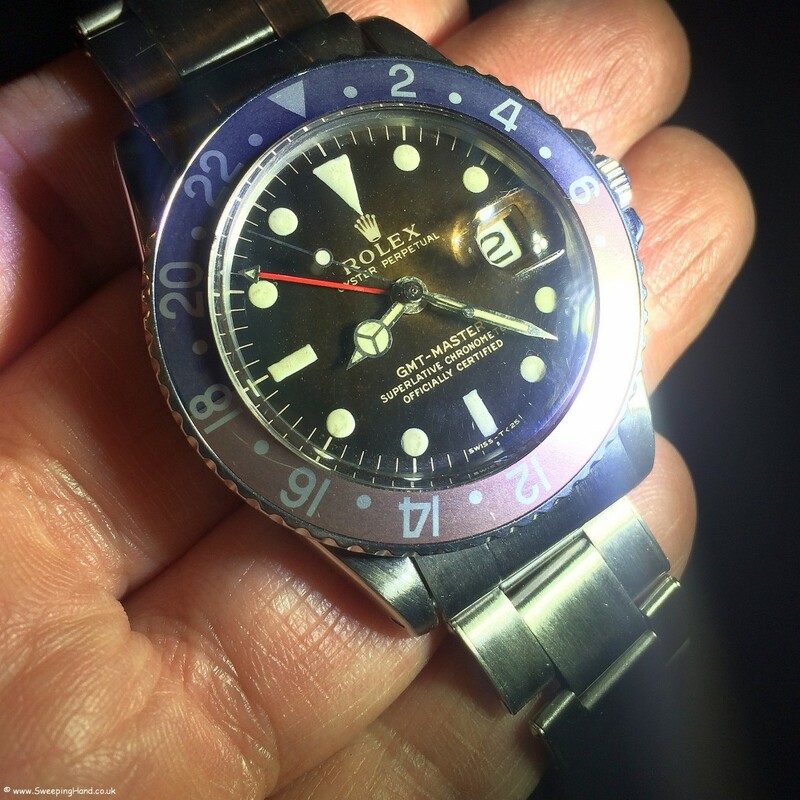 The original movement is clean and keeping good time. This is a fantastic collector set watch with amazing gilt dial that is so rare to find now on early GMTs and as such are in great demand – I can’t remember the last time I ever had one of these so I don’t expect it will hang around…. 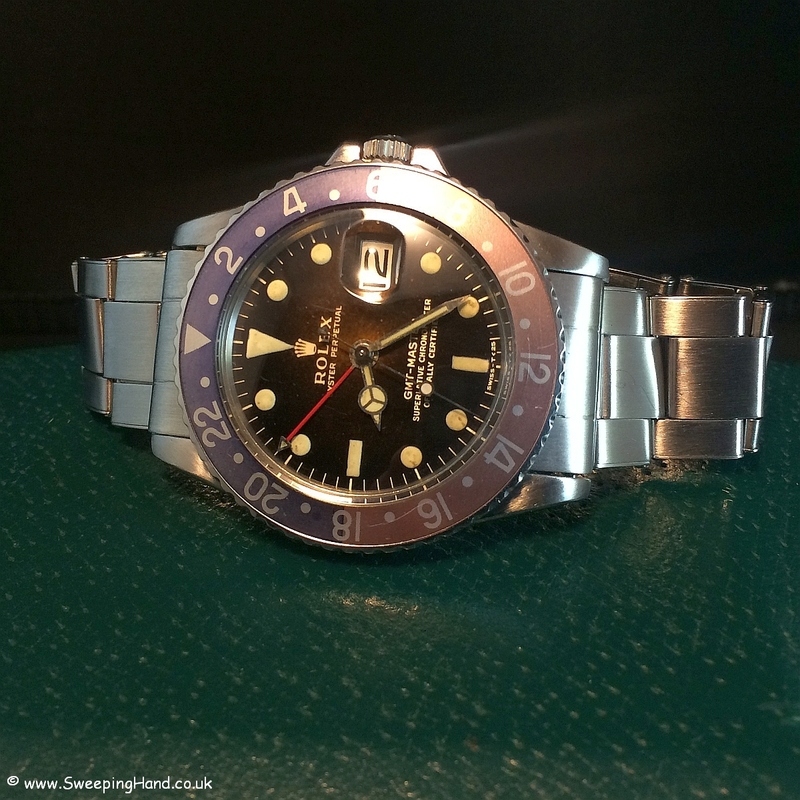 PreviousPrevious post:Rare Tudor Milsub – French Navy Issued Tudor Submariner Marine Nationale (M.N.80)NextNext post:The Paul Newman Omega Speedmaster!